After having perused the visitor stats, I’ve discovered that someone has typed c+h-axn+c-e into Google and come to the site. And glory be, yes, we are the #1 search result for the best darn DA clue in a while, c+h-axn+c-e.
Super-duper was suspiciously odd; we had realised that. Yet by the time we had surmised that it was probably an anagram clue where car is Matt’s Rolls = super-duper, we were over the DA and checking the answers. It took a moment to sink in, and it was enjoyable when it did — super-duper = scam artist (as in someone who dupes) is quite funny. An auditory and double-meaning classic! Heckler = mocker so that heckler yelled = mocha = coffee. The movie was great; so was this clue. Sea-monster = scylla (from The Odyssey), sea-monster say = scilla and treacherous rip = pri, which gives sea-monster, say, below treacherous rip = priscilla = desert queen. Thanks to AL, we can give this quality clue its due. Here, thus = so, during break = in gap, thus drinking (as in consuming, which is another inventive DA containment indicator), during break = singapo, wine = riesling and one left wine = resling, all of which gives thus drinking during break, one left wine = singapore sling = cocktail. 16 across: Setter gettin’ high from hallucinogenic? This fine clue I dedicate to Hunter S. The penny dropped here when considering the oddity of gettin’ and concluding that this hallucinogenic probably ends in in. Mescalin immediately came to mind, and then so did the explanation: setter = me and gettin’ high = scalin’, giving setter gettin’ high = mescalin = hallucinogenic. RC had deciphered this one early on in the piece simply from the cross clues, but we did not venture to write it in lest we be left with eggs on our faces given our lack of explanation. Sure, hit = ram, on initial = o, deficit = short which gives hit on initial deficit = ramos hort, but why does handy president = ramos horta (what’s with the handy more than anything) and why does chiefly = a? We had correctly surmised that on arctic sledge = narcotic, but then why does number = narcotic? Or is it number on arctic = narcotic and sledge = narcotic? What? The best we could cup up with is break = gap to provide the justification for the happy direct clue, cocktail = singapore sling. Other than that, we had nothing for why thus drinking during break = singapore sling. The beginnings of this week’s doings were done waiting for JC to attend to her dressing before outing into the evening where with RC there was a meeting and the cryptic work was given his blessing. The next day, all three of us were at my house, scratching our heads with bemusement and digging into my mum’s food parcel for breakfast. Overall, a fine weekend made finer with DA. Here’s a fine example of why DA still remains a thrill despite how powerless he can make you feel at times. C+H-AxN+C-E = calculated risk speaks for itself. Intricate clue that I greatly enjoyed working out, albeit retrospectively. One = i, buffoon = nong, Spielberg movie = ET and movie = film so that one buffoon rewound before a Spielberg movie disrupted movie = filet mignon = cut worth savouring. Anything prurient always makes me laugh, and this time we’ve got wireless = trannie = bra-wearer of the male persuasion. What’s special here is DA’s use of words within the same semantic range. Here, draw amps near the electric leads = Dante = Italian meter-man. I’m supposing alpine heroine = heidi even though I don’t know why, just like I don’t know why so-called nerve shown by single = heidi. Here, love = nil. Other than that, I’ve got nothing. Kalashnikov = arm, but the rest I can’t explain. Leave senseless = deafen, which I suppose means tenants astride a fence = deafen makes little sense to me. Cruel blow = sucker punch, but I can’t work out the rest. I’m supposing ill-equipped = unorganised, but I can’t figure anything else out. Does inkling = flash notion, or does inkling = notion? Either way, I can’t explain the rest. Here, itchy year = seventh (as in seven-year itch), but the rest beats me. I’m supposing a place for subconscious thought = back burner, but rearrange = back burner? What? Altered = morphed, so I’m supposing he’d = hed, but how does skied ball = morp? Petty crim = spiv and four = iv, but I don’t get illegal bookie = sp. Mongrel = cur, but I have nothing for PM can go = cur. This one made me want to cry. I was already asleep when RC texted me for a late DA on Friday night, and the remainder of the weekend was too busy for me to share the cryptic joy, so I attempted it solo over the last few days. I feel as if my powers are failing me. 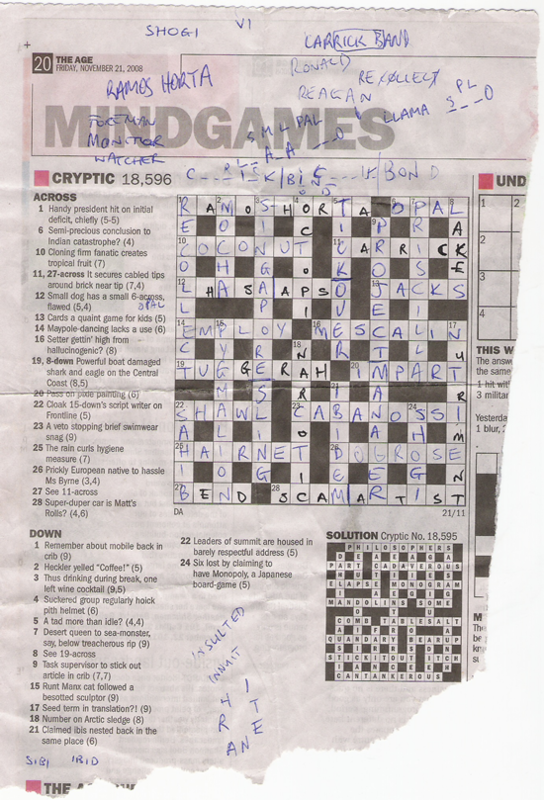 Despite its being carried around in my back pocket most everywhere I went, I got out little more than a quarter of the crossword. And despite having the answers in front of me, there’s still plenty I can’t explain. In what is becoming a disturbing trend, DA has been using bits of whole words as instructions (this often happens with words like backdown or, as we will see in the next nastiness example, with desktop, but what DA is starting to do is getting crazy). In this one, battle is the anagram signifier, so that battleship names = misshapen = distorted. If this continues, and starts being a part of more difficult clues, we can pretty much forget about getting anything out. This is something I’ve never seen before in a cryptic, and I wilt at the thought of its structure being followed in future. Here, crazy = insane, so that it is is put in the word sane, giving it is crazy, perhaps, for desktop = sanitised = to be clean. But what’s mental here is that the synonym for crazy, insane, ends up being an instruction, and that instruction is only partially within the word itself! 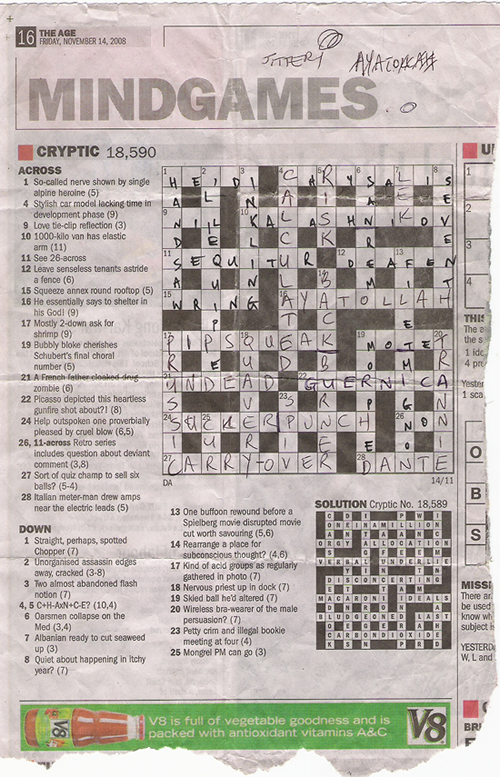 Can you imagine how difficult these crosswords will become if DA really starts to let loose with constructions like these? “Laptop machines”, by one of those preposterous twists of circumstance that make you wonder who is running things and why they haven’t got anything better to do, just happens to be an anagram of “Apple Macintosh”. If an anagram is a derivative rearrangement of essential elements, then one might be disposed to argue that such has been their rise in influence and prestige that almost every new digital product seems to be an anagram of Apple. To control ball = dribble, but nothing else makes sense. One Zeno disciple = stoic, or, more likely, Zeno disciple = stoic. The rest, though? 8 down: Twisted bachelor-ess action sequence in The Dish? The Dish = casserole, and bachelor-ess without the b and h is an anagram of casserole, but how that all works is beyond me. Wearing beanies = ebeians, which leaves students = pl so that students, wearing beanies = plebeians = they are common, but why does students = pl? Google tells me that a tangara is a type of train used in Sydney (this should technically be a DA Teaching, but I don’t find it interesting enough to bother reporting), which makes In Sydney, train = tangara. Everything else, however, I can’t work out (although mustang = horse could have something to do with the explanation). To be clean = sanitised, but I can’t quite make out the rest.